O_o No one has commented on this fine observation? Shocked am I… SHOCKED i say. Speed reading Braille? He’s a madman! Interesting question though. Which would hurt more; Many small paper cuts, or one huge one (see #19)?? Ban cheesegraters: a blind man had had a heart attack once. Scariest book he ever read. Many small ones, because the big one would kill you and you wouldnt live long enough to feel the pain. 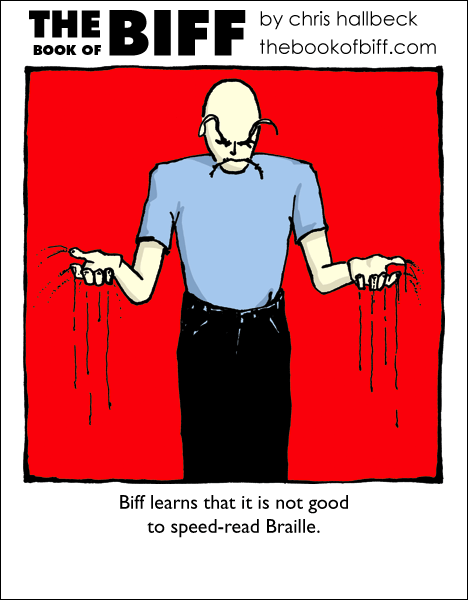 Mmmmm… and why does Biff read Braille? A wizard taught him how? Or mabye its because HE NEVER OPENS HIS EYES?!? Given his hazardous lifestyle, it may just be as simple as being prepared for the inevitable, unfortunate incident that finally blinds him…? Must’ve been a bloody good read. atm, maybe at 50 mph! Um…question…why have braille on drive through anything? It’s because all of the number plates for ATM’s and such are mass-produced. So when they make the number plate, they don’t know if it’s going to wind up on a drive-through ATM or not. Wow, he bleeds…! …He bleeds pure old-man-hatred. Malachite Dragon: That is PRECISELY what happens two minutes before the bell and I haven’t finished my reading assignment for class. That happens to my fingers if I play guitar for too long. Summer of ’69 anyone? But what use is it? then why did he not bleed in papercut? CALL 60 MINUTES AND OPRAH! Well, obviously, all the small cuts would activate more nerve endings than one big cut. It’s a Chinese torture method you know. totally NOT normal length look back at an early comic. I’ve hurt my eyes doing that. It’s obviously the ink that was on the paper. It all smeared and is now falling off his fingers. he kept trying different fingers. Hmm; the thing is, the Braille on books, the dots are small enough that they wouldn’t cause any injury, no matter how quickly you move your fingers over them. The stuff on those name-plates that say what room something is, however; that’s a different story. Ah well. Probably isn’t the first time. this happens when i have a typing speed of 200 words a minute. Or is he just in search of another hilarious way to hurt himself?